WEST LAFAYETTE, Ind. -– Purdue University’s efforts to help war-torn Afghanistan improve the capabilities of its agricultural universities enter a second phase with an agreement for $32 million in additional funding from the U.S. Agency for International Development. The Strengthening Afghan Agriculture Faculties agreement, announced Monday (April 4), is a five-year grant to continue and expand the work Purdue initiated under the USAID-funded Advancing Afghan Agriculture Alliance, known as A4. Purdue received $7 million in funding under A4, which ended March 31. “We’re ramping up what we have been doing,” said Jess Lowenberg-DeBoer, associate dean of Purdue’s College of Agriculture and director of its International Programs in Agriculture. Purdue partners under the new project are Kansas State University, North Carolina State University, Tennessee State University, University of Missouri and Washington State University. Three universities in India – University of Agricultural Sciences, University of Horticulture, and Karnaktaka Veterinary Animal and Fishery Sciences University – also will continue as Purdue partners in A4. The new USAID funds also will support activities to link agricultural universities to the Afghan Ministry of Agriculture, Irrigation and Livestock. The consortium will be charged with initiating those programs. Afghanistan faces many development challenges. Increasing productivity and establishing effective, efficient postharvest management systems are keys to improving farm income and developing the commercial agriculture sector, said Kevin T. McNamara, assistant director of IPIA and head of Purdue’s Afghan efforts. “The new grant will help Afghanistan meet the workforce needs of the agriculture sector – for the Ministry of Agriculture and other government agencies – and to support development of the commercial sector,” McNamara said. It will be up to the Afghan people to chart their future in agriculture, Lowenberg-DeBoer said. “But they need the tools to determine that, and we can help them,” he said. The Afghanistan initiative is positioned well for continued success, said Jay Akridge, Glenn W. Sample Dean of Purdue Agriculture. “Under the very able leadership of Jess Lowenberg-DeBoer and Kevin McNamara, Purdue Agriculture has proven its expertise and capability to lead the new consortium in the second phase of this exciting project,” he said. A4 focused on developing junior faculty, facilities and curriculum. 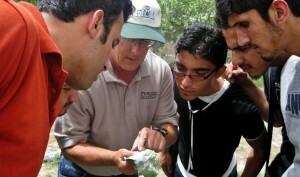 Junior Afghan faculty were sent to India and the United States to earn master’s degrees and receive short-term training. Purdue staff also helped establish student farms, re-establish university research farms, activate teaching labs, and develop extra- and co-curricular activities. The second phase will increase the number of young faculty involved in graduate and short-term training abroad, with 18 master’s and doctoral assistantships for study in the United States and 74 in India. It also will allow Purdue to increase the number of long-term staff in Afghanistan helping junior faculty build their teaching programs and expand workshops given by consortium faculty. While the new effort will continue the focus on rebuilding core academic programs, the Purdue consortium also will begin development of agribusiness/agricultural economics, food science and agricultural engineering programs. The consortium also will continue to focus efforts on agricultural universities in Kabul, Balkh, Heart, Kandahar and Nangarhar while including faculty from all agricultural universities in long- and short-term training.